We ‘make’ villages rather than building soulless housing estates. “This is Life as it Should be Lived.” Adam Edwards, The Telegraph Newspaper. We are very pleased to announce that our new project at Oakley Orchards in Great Oakley, Essex is underway. This will be a neighbourhood of 51 houses built to the Village Makers Custom Build model where people can choose a serviced plot and configure their high spec house. 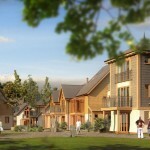 The neighbourhood will include a new Village Hall, Doctors Surgery and Village Shop. 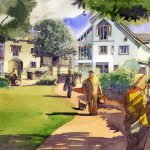 Dartington– Following on from the Dartington Future Homes Conference in February 2015 where Bob was a keynote speaker, we’re now working with the Dartington Hall Trust to design and deliver 41 houses on the Plantation site, which is on the edge of the heritage Dartington Estate. More. 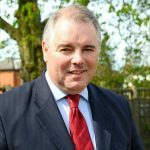 Richard Bacon MP – Bob has been to several meetings at the House of Commons to have discussions with Richard Bacon MP who is behind the Private Members Bill, Right to Build. Richard is interested in designs such as the Wintles, which he feels represents the beauty that he would like to see in future schemes around the country. We are working with the NACSBA, National Custom & Self Build Association, the voice of the custom and self build sector, to forward the ideas of custom building and to get projects started. 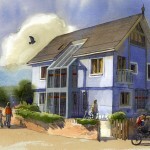 The Wintles – This is our prototype eco-neighbourhood. 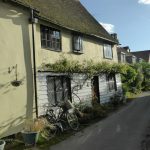 We bought the land in 1998, partly as a reaction to the planning application for a run-of-the-mill estate on the site that was being considered at the time. More. Higher Newham – A proposition to open up 90 acres for the benefit of the people of Truro, to create an education based working farm and sustainable exemplar village. More. St. Mellion – A golf course in an Area of Outstanding Natural Beauty. Permission was only given to us to build here because of the unique Living Village ‘sense of place’ we intended to establish. More. 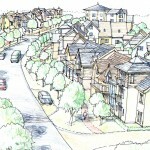 Glendevon – A new village as part of a major regeneration scheme at Winchburgh, 18 miles west of Edinburgh. A potential first for Scotland as a new settlement which combined energy-efficient houses with an attractive place to live. More. Bells Court – Our first development: five houses set around a shared courtyard and all linked to each other with garden walls and walkways. 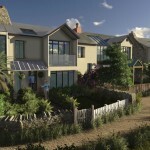 All this on a site that would probably have taken five traditional detached units with integral garages. People must have thought we were crazy. More. Tattenhoe Park – Imagine a Living Village in Milton Keynes! This one was to be something that stood out in a town that is unashamedly designed for the car. 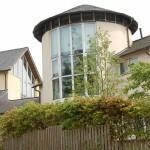 We had high hopes that in awarding us this site, the Corporation was signalling a new direction. More.